Combat diversity: Fight through solo missions as well as co-op and squad-based operations, or pilot heavy walkers and hover tanks through outdoor battles and epic firefights. Character transformation: As you're captured and converted to Strogg, you become Earth's only hope. Massive invasion: You are not alone—you and your squad are part of a massive invasion force. 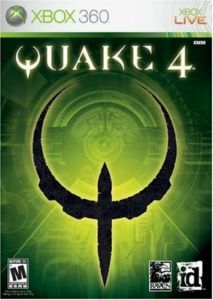 Masterful design: Quake 4 utilizes the industry-leading DOOM 3 technology to create an unparalleled visual and aural experience. 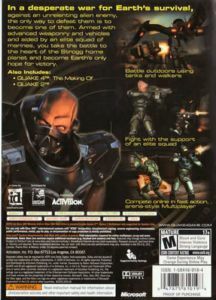 Multiplayer features: The arena-style multiplayer allows you to play as Strogg or Marine in Deathmatch, Team Deathmatch, and Capture the Flag modes.